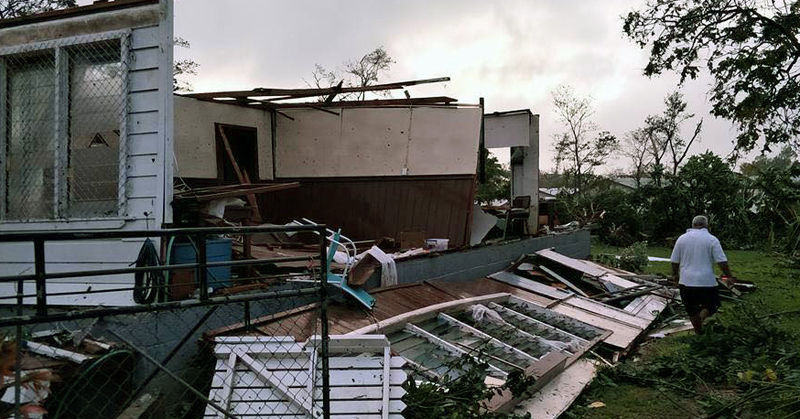 On 12 February, Tonga was hit by the strongest storm its seen in 60 years. The damage toll is massive. At least 70% of the population has been affected. Please donate now to support the recovery efforts in Tonga. Please call 02 8267 4267 to donate or use the form on the right of the screen to make a secure online donation. Upon completion of your deposit, please forward an email to info@unitingworld.org.au with the brief description which outlines the amount deposited, to where the funds are to be directed (in this case, Cyclone Gita), to whom the receipt is to be made out to and the relevant contacts details for same. We are in regular communications with our partners at the Free Wesleyan Church of Tonga (FWCT). They report that while there is massive damage to buildings and infrastructure, they are rejoicing in the minimal reports of injuries or death. Electricity is yet to be restored and communications are limited. Everyone is fully occupied with clearing up rubbish and making assessments of the repair and rebuilding work required. Our correspondent reports that “community spirit is high and trust in God is strong. The main part of Nuku’alofa seems to have fared the worst, and schools have been particularly hard hit. Tupou College and Queen Salote College have both sustained substantial damage. FWCT is keen to repair and rebuild so that children can get back to school as soon as possible. We will continue to update this page with more details. In the first instance, your donations will go to meeting immediate needs, doing assessments and planning for recovery. This will transition to funding recovery and rebuilding efforts over time. Cyclone Gita also affected some Fijian islands. Please keep our dear brothers and sisters in Tonga and Fiji in your hearts and prayers.